Pamper Your Loved Ones with Glow-ology! If you’re in need of gift ideas for Mom, Dad or grad, Glow-ology has you covered this spring and summer! Spring is a big gift giving season and if you are running out of ideas for Mom, Dad, or Grad, let me recommend Glow-ology! Made with organic and natural ingredients and 100 percent biodegradable, Glow-ology luxury bath and body products provide the perfect gift to pamper those we love in an environmentally friendly, socially responsible way for Mother’s Day, Father’s Day, graduations and bridal showers! Formulated for sensitive skin, Glow-ology features luxurious body lotions, refreshing body washes and gentle hand creams that feature skin-nurturing formulas with uplifting scents and elegant recyclable gift packaging with inspiring sentiments and quotes by beloved authors and poets. · Smile. Wish. Believe. : A fresh blend of juniper and pineapple. Perfect for moms and grads. · Imagine. Discover. Begin. : Crisp white cotton and ocean notes. Great, clean scent for dads. · Renew. Thrive. Flourish. : Ocean breeze and fresh airy energy. Refreshing, versatile for anyone. · Heart. Soul. Mind. : Sweet cherry blossom and leafy greens. With packaging featuring inspiring quotes about love, it’s ideal for brides and bridesmaids. The Glow-ology hand wash are some of our favorites ever used in our house! They not only smell A-MAZING but they are also made in the U.S. (California) with natural and organic ingredients carefully selected based on proven historical data and sourced from around the world. Each formula took more than two years to perfect, using organic ingredients such as white tea, chamomile, clover, calendula, oat, lavender, sweet almond and comfrey, as well as protective vitamins B5 and E.
PLUS, the Glow-ology collection is animal friendly, contains no animal ingredients (except beeswax, wildflower honey and milk,) and is never tested on animals. Glow-ology products never contain parabens, dyes, petrochemicals, GMOs, sulfates, triclosan, phthalates or formaldehyde donors. 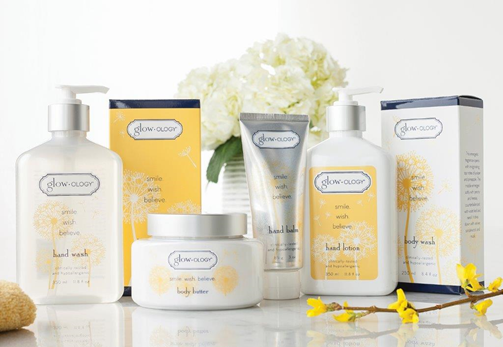 Formulated for the utmost sensitive skin, Glow-ology skin care products are clinically tested and hypoallergenic. The Glow-ology soaps are at every sink in our house and I feel great having my children use it for their sensitive skin as well as my guests! Everyone comments on the great smell! The body washes are also in our showers and baths and provide a luxurious experience every time! You can purchase The Glow-ology collection from www.GlowologySkincare.com and in more than 1,300 gift shops across the country, including New York, Los Angeles, Chicago, Boston, Philadelphia, Dallas, Austin and other cities. Prices of the debut Glow-ology collection are as follows: hand balm (3 oz./$12 SRP), hand lotion (11.8 oz./$18 SRP), hand wash (11.8 oz./$16 SRP), body butter (8 oz./$22 SRP), body lotion (8.4 oz./$18 SRP) and body wash (8.4 oz./$16 SRP).